Jessica Campbell Jones, or more commonly known as Jessica Jones, is one of the female superheroes in the Marvel Universe. She got her powers when she was just a high school student after an accident with radioactive chemicals. The car that she and her father was riding in collided with a military truck. 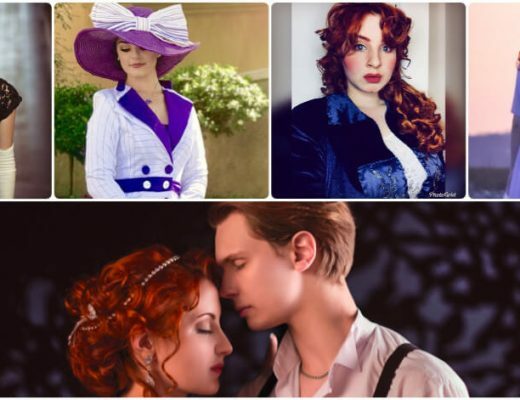 Her father died, which puts Jessica in an orphanage where the Jones adopted her. She later discovers that the accident has given her limited vulnerability and flight, and super strength. Jessica Jones attends the same school as Peter Parker, Spider-Man’s real identity. It was the web-slinger who inspired her to use her abilities for good and be a superhero. 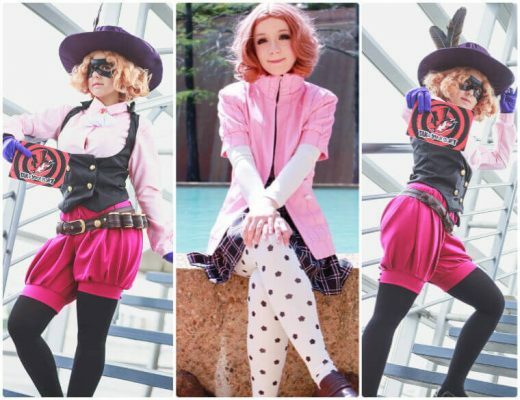 She was inspired when Spider-Man was fighting against the villain Sandman in their school. Jessica Jones is one of Netflix’s popular Marvel TV series, especially season 1. 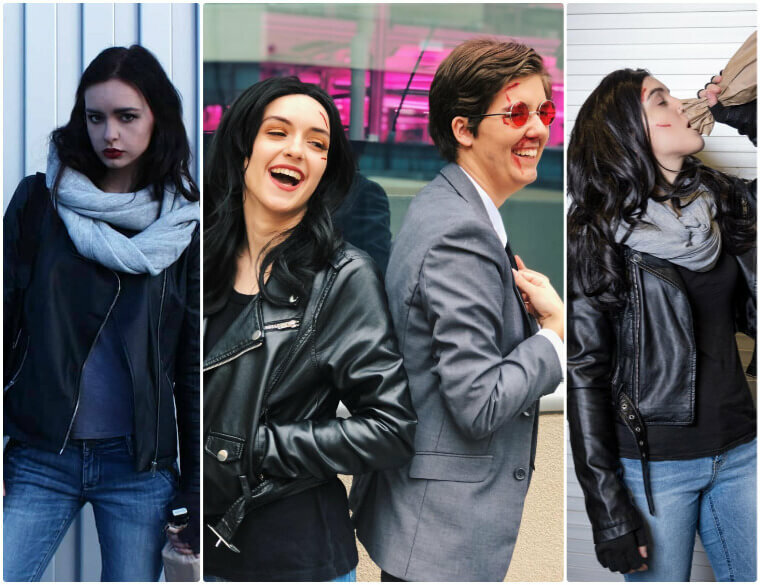 That makes Jessica Jones another popular option to cosplay in. It will be a Jessica Jones costume guide here. Jessica Jones is one of the female superheroes in the Marvel Universe. She possesses super strength, flight, and limited invulnerability. Jessica got her powers through an accident with radioactive chemicals. She had no idea to deal with the newfound abilities at first. But seeing Spider-Man in action inspired her to use it for good. Unlike a lot of superheroes, Jessica Jones doesn’t wear any costume when she fights or goes on missions. 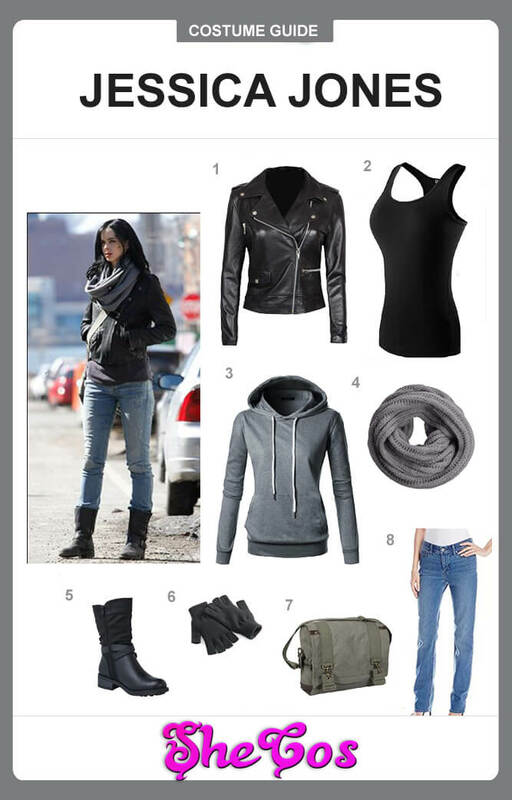 This Jessica Jones costume guide will feature the most common outfit she wears when she does heroic things. Her usual outfit consists of a black tank top with a black leather jacket on top of it. 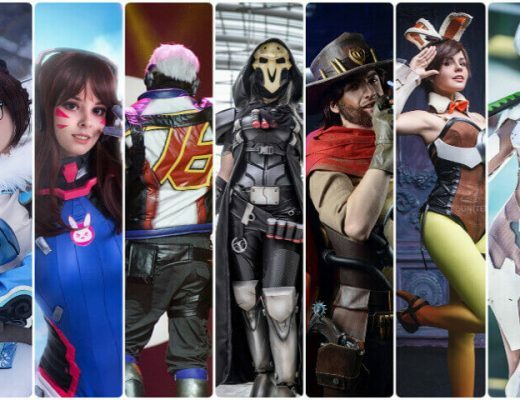 The cosplay suit will also come with a grey scarf, blue jeans, black fingerless gloves, and black boots. It also includes a grey messenger bag to complete the outfit. The set will come with a grey hoodie jacket to provide an alternative look. Jessica Jones is likely one of the most real female superhero to dress up in since the character doesn’t wear any costume or any unique clothing. She mostly wears casual clothes whenever she fights or goes on a mission. She doesn’t make an effort to try and hide her identity or use any weapon, so this character doesn’t have a lot of accessories. But don’t let her simplicity fool you, as Jessica Jones is a powerful character in her own right. Besides, her uninspiring and straightforward look still doesn’t hide the fact that she is also a badass female character. 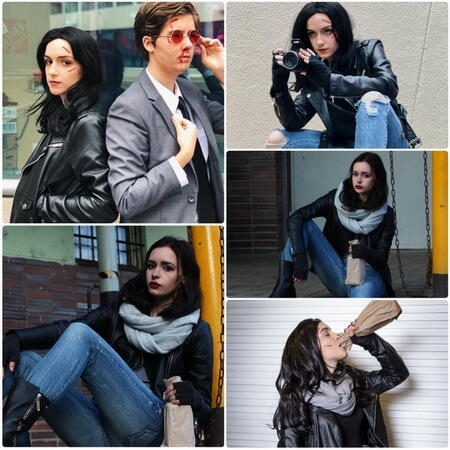 Looking at the Jessica Jones cosplay photos, you can see that she is still a badass female character. If her outfit makes you think that she is nothing more than just a regular rebel female, then her fists will likely make you feel otherwise.